I suppose like many other programmers out there, I gravitated to math in high school; I was the kid who actually wanted to figure out what time the two trains leaving Boston and New York would pass each other. Nowadays I’ve spent a significant amount of time not just taking test, but writing them as well. 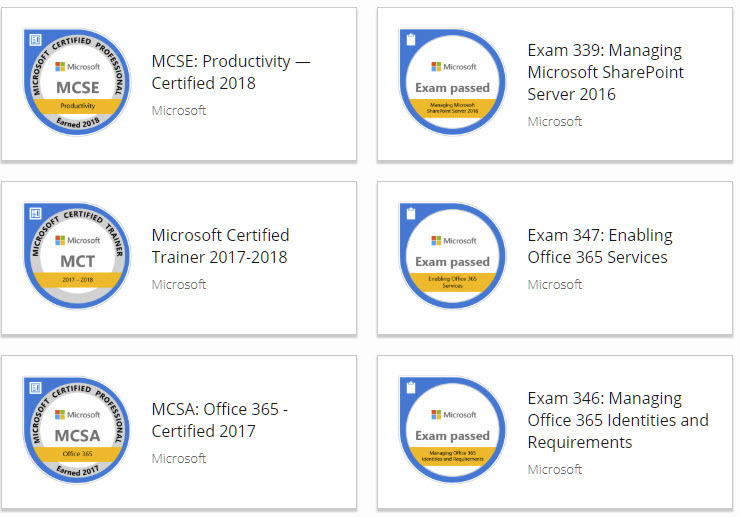 I’ve been involved in various parts of the test taking process, including writing exam questions, exam question refreshes, writing practice test questions, and as a Microsoft Certified Trainer I also teach on the technologies the tests are written for. I’m happy to say I just passed my 23rd Microsoft exam of my career, for SharePoint 2016. Microsoft is well known for its love of TLA’s (three letter acronyms) and it’s been somewhat amusing to me that through the years they seem to have run out of acronyms so they start recycling. Once upon a time, MCSE stood for Microsoft Certified Solution Engineer. Now, the acronym stands for Microsoft Certified Solutions Expert. Regardless of the term, I’ve now achieved the MCSE: Productivity certification from Microsoft. This certification not only hopefully instills confidence in my clients of my competency in dealing with SharePoint 2016 on-premises, but it means I’m also officially able to deliver Microsoft Official Curriculum on Office 365 and SharePoint Server. Please feel free to contact me if you’d like me to deliver training or consulting service to your company.